I enjoy taking advantage of the opportunity to see lovely old homes and to imagine the lives of those who occupied them. Here in my home town of Lincoln, Nebraska, the Thomas P. Kennard house is a lovely example of Italianate Victorian style. Kennard was Nebraska's first Secretary of State. 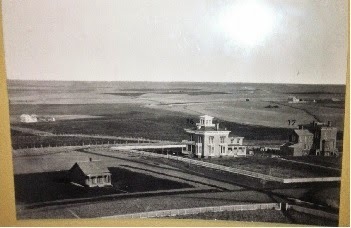 His 1869 home is the oldest structure still standing on the capitol city's original plat. For people like me who love learning about the past, stepping through the front door is an exercise in time travel. To get an idea of the "buzz" this house would have created when it was going up, take a look at the photo at right, which shows a view of the house from the first state capitol building. What's the first thing you notice? The "nothing"? Me, too. I'd say that locating a state capitol in this place was an exercise of faith in good things to come. Can you imagine moving onto this treeless plain from, say, Indiana or Illinois? I wonder at Mrs. Kennard's reaction. I wonder if she ever looked East from that cupola and longed for home. And trees. The corbels and other architectural elements on the home's exterior are lovely, but I'm glad it isn't my job to keep them painted! The first thing I noticed stepping inside this home was how very dim the lighting was compared to what I'm accustomed to in 2018. Reading by lamplight sounds romantic, but I'm thankful I don't have to do it. Isn't that walnut bed gorgeous? 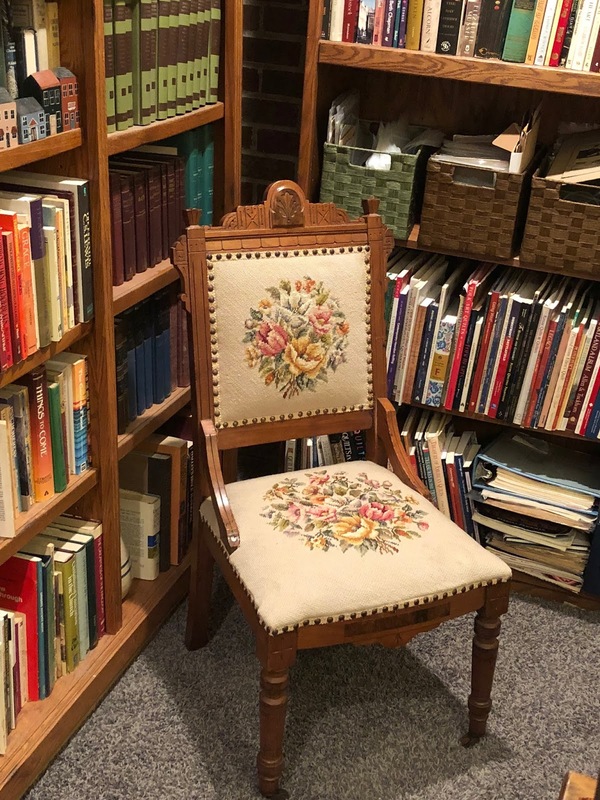 I love everything about this room ... the burled walnut headboard, the hair wreath in the oval frame n the opposite wall ... and the very early treadle sewing machine that is just out of sight at the lower left of the photograph. Do you see the date on the drop of the bedcover (in the shadow of the chairback)? Is that stuffed work? I don't know, but if my eyes aren't fooling me, the date is 1869. Who made it? For what special occasion? See the needle point chair sitting at the machine? I have one much like it that belonged to Jennie Venetress Kingsbury, my children's great-grandmother. I just stopped typing to take a photo of it (see photo at right). My needlepoint replaced the original silk covering that was rotting away. The pillow shams on the bed in this period bedroom are examples of redwork embroidery. I purchased a similar pair at an auction in Nebraska. Mine are dated 1869. Since Nebraska became a state in 1867, my pillow shams could have come west with a Nebraska pioneer! The home on the cover of my novel Sarah's Patchwork is right across the street from the Nebraska State Capitol. It inspired the house where Sarah Biddle worked and met the wealthy man who would fall in love with her. I was honored when Jim and Linda McKee, who operated a wonderful local bookstore at the time, sponsored a book release party at this home, which had been saved from near ruin by someone who looked beyond plaster and lath into the lives of the people who inhabited this grand old lady. I do enjoy visiting historic homes that are staged realistically! One of my favorite visits to date was Campobello, FDR's summer camp located just over the border of Maine into Canada. It's definitely like stepping back in time. Thanks for the post! Campobello sounds like a great place to visit. I hope to do that one day when I have a chance to tour the New England states. It's on my wish list. And around the same time University of Nebraska was built. Must of been interesting to go to school in a place with nothing around. And today it's craziness around this time of the year as not only UNL students moving into dorms but also union college and a few of the other college that are in this city too. I live in the downtown area and walk by not only this home but many other homes and business in the downtown area. To move to a place that has no tree's must of been a shocker. I also lived in North Platte for a while a lot of the local there refer to Nebraska as the high desert of the north. I have a couple of old photos of those days when the University was only one building. Amazing how it's grown. 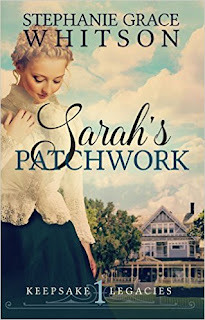 You probably recognize the house on the cover of Sarah's Patchwork, too! And I agree about the "no trees." I can't imagine how that would have felt ... especially for settlers from wooded areas in the East. Early explorers called much of our state "the great American desert"! Thanks for chiming in, Kim. It means a lot to get feedback on blog posts. I remember reading that when the county I live in (where that photo was taken), there was ONE tree in the entire county. The surveyor actually mentioned that fact in his survey report. That lends understanding to why an early settler founded Arbor Day ... which is all about planting trees. That same view today is quite lush thanks to people who planted trees. I love old houses. I grew up in one that was built in 1836. It is now a museum. This was a very interesting and informative post. Thanks.